Love this DOLCE & GABBANA Boys Mini Me L’Amore è Bellezza T-Shirt. Meaning Love is Beauty, this mini-me white T-shirt was featured on the Men’s Runway Show at Milan Fashion Week. The perfect streetwear look, this super cool shirt has an appliqué crown on the front. Looks perfect with a pair of D&G exclusive black and white geometric print pants. 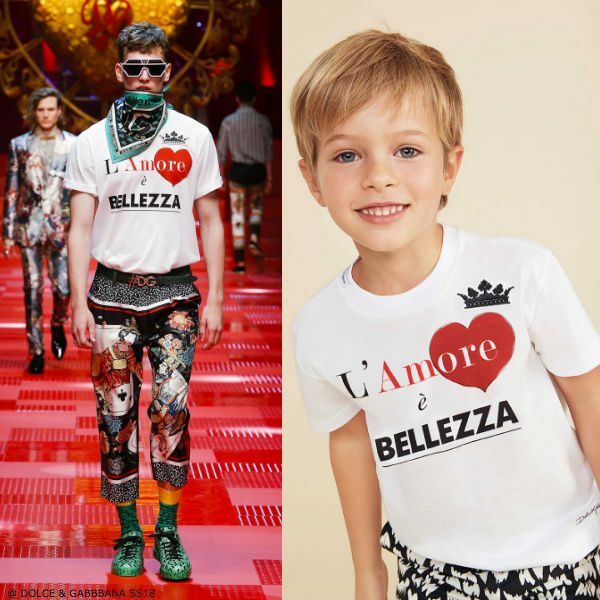 Unfortunately, this DOLCE & GABBANA Boys Mini Me L’Amore è Bellezza T-Shirt is not currently available. You can shop similar Dolce & Gabbana Boys clothes from the current collection online.